The Wat Tchoum Khong (which means ’Temple with the heart of a Gong) was constructed under the reign of King Sukaseum (1836-1851). It is one of the temples with the most flowers in Luang Prabang. Situated in the middle of the peninsula, where you will find all the commercial and tourist activities of the town, it is still a very calm place. 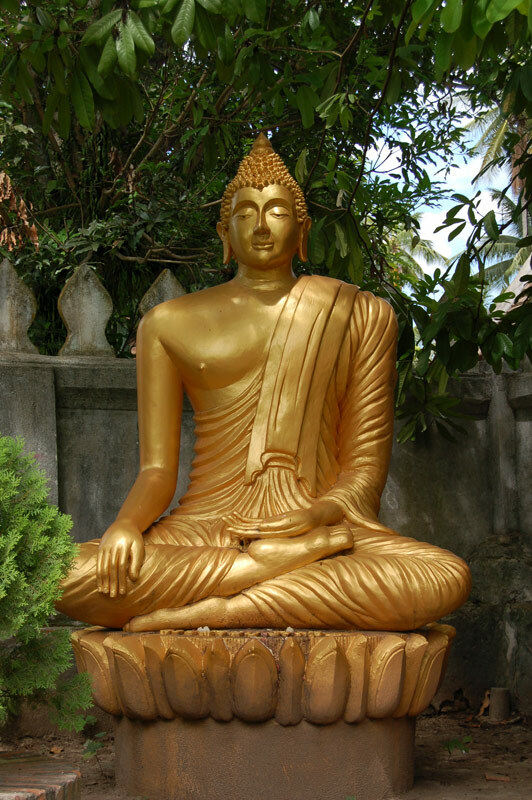 The garden is to be admired with its recent statues of Buddha in numerous traditional postures. The buildings have been recently renovated and the garden landscaped. The bougainvilleas are the most beautiful in town, which is renowned for its flower beds. 2 stone statues flank the stairs that lead to the Vihan. Of Chinese inspiration, they were given to King Chantharath (1850-1872) by the Chinese ambassador of Kunming, when he visited Luang Prabang. Showing elements of yin and yang, the statues represent two of the principle bodhisattvas (or enlightened beings) of Chinese Buddhism: Vajra, (lightning or a clap of thunder), representing masculine principles, and Ghanta representing a bell, or feminine principles. You can admire the Prince’s old house, just beside the temple, the Villa Xieng Mouane. It was renovated at the end of the 1990’s by Heritage House and, since 2006, hosts a tourist information centre and certain exhibitions. The small but attractive Wat Choum Khong (Chum Khong, Chom Khong; its “surname” is spelled either Sourintharame or Sulinthaham), “the Monastery of the Core of the Gong,” is located northeast of the Royal Palace Museum in Luang Prabang’s heritage zone. 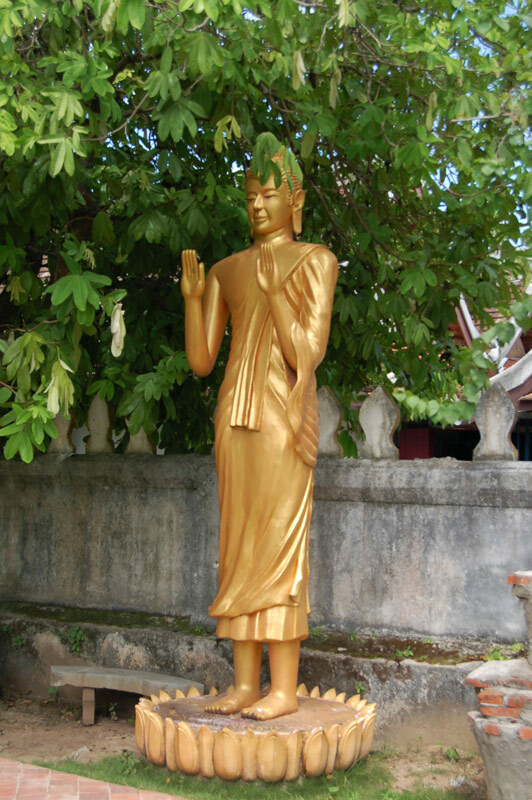 The name “Choum Khong” is derived from the raised boss in the center of a bronze gong, from which, it is suggested, the sim’s central Buddha figure was partially made. 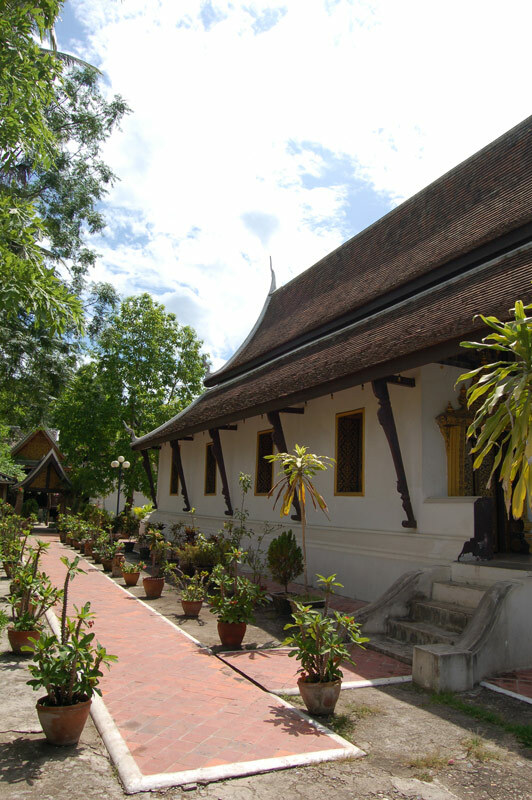 Choum Khong was founded by Phakhu Keo in 1843, during the reign of King Sukaseum (1836-1851). The sim was restored in 1933 and 1951, and its decoration was entirely remade in 1962. The doors and added windows in particular were the special project of the Venerable Houmpheng. The sim has also been renovated on several additional occasions in the more recent past. The wat shares a common wall with Wat Xieng Mouane, and the sims of the two monasteries share a similar pattern of pillars and façades. Choum Khong has a double-sectioned roof that is divided at the point of the tallest front columns; the roof lacks the common ornamental dok so fa (nhot so fa) on the ridgepole. The single veranda in front of the sim has a low platform (though higher than that of the nearby sim of Xieng Mouane); its roof is supported by two tall and two short stenciled and gilded vermillion lotus-topped columns. There is a single stairway in the center of the veranda and one on each of its lateral sides. There are no side galleries. The nave has three entry doors from the veranda. The façade has an elaborately carved wooden lambrequin (or Dok Huang Pheung) beneath the finely designed and carved central tympanum; two additional carved lambrequins on the façade frame the entry doors on either side of the main door. Somewhat unusual for sims in Luang Prabang, above each of the lateral doors of the front wall of the nave there is a triangular segment that mimics the triangular sections of the façade between the taller and shorter columns. As with most Luang Prabang sims, there are elaborate carved and gilded doors and surrounds. 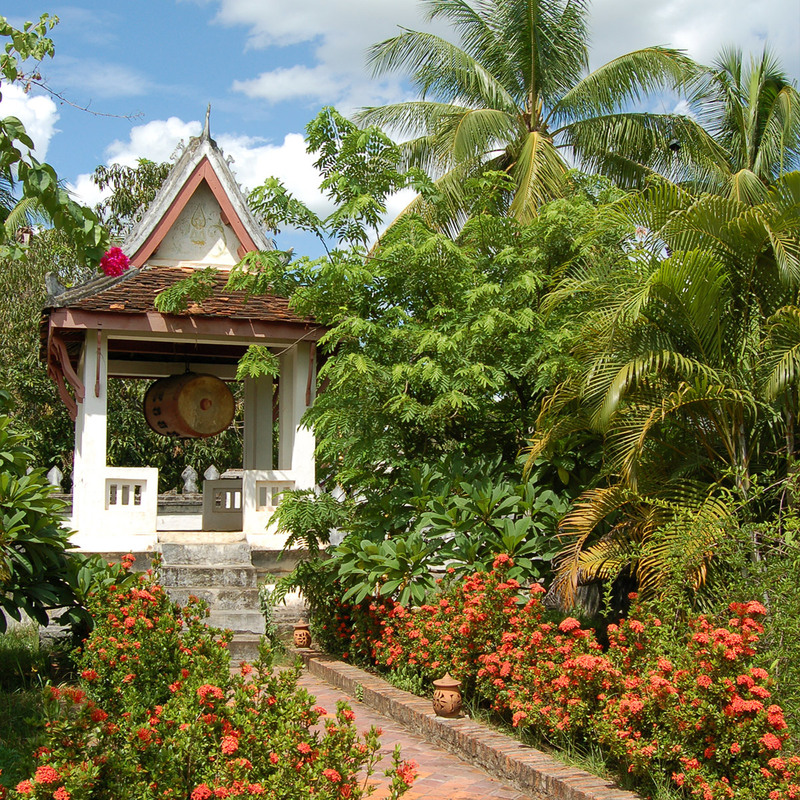 The grounds of the wat are quite attractive with considerable flora in both container and in-ground plantings. There is a fine well-delineated garden area in front of the sim with gilded statues, stupas, a drum tower and chapel. 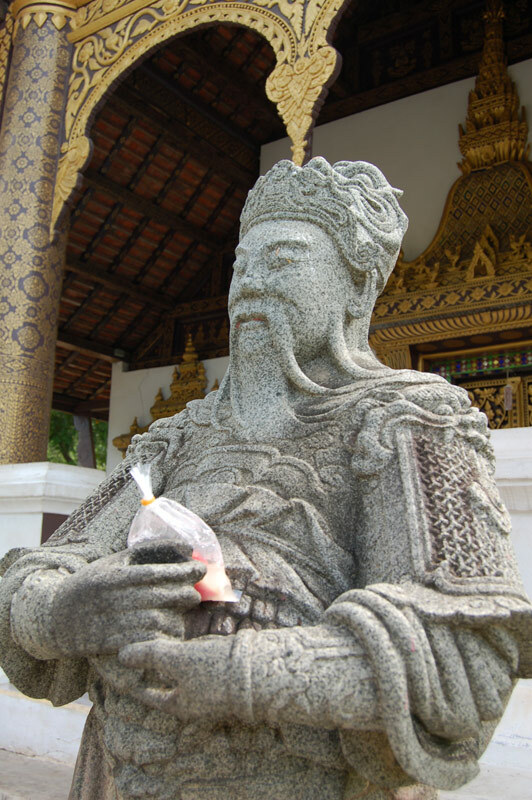 Of some significance, and showing Choung Khong’s continuing contact with the past of Luang Prabang, are two carved stone statues, distinctively Chinese, that now are in front of one of the kutis, or living quarters. In 1861 they were presented to King Chantharath (1850-1872) by the Chinese ambassador from Kunming during his visit to Luang Prabang. Reflecting elements of yin and yang, the statues represent two primary bodhisattvas of Chinese Buddhism: Vajra the lightning or thunderbolt representing masculine principles and the Ghanta representing the bell, or feminine principles. The latter symbol, of course, is also tied to the name of the wat. Their subsequent history in Luang Prabang is rather interesting. The (possibly somewhat disreputable) interim High Commissioner of France in Luang Prabang in the 1890s, M. Joseph Vacle, placed them in front of his residence. After the First World War Boun Khong (Tiao Maha Oupahat), one of the most eminent preservers of the cultural heritage of Luang Prabang and father of the Princes Phetsarath, Souvanna Phouma and Souphanouvong, deposited them in the Royal Palace. Then in the 1930s, the Laotian Prince and Director of Culture, Tiao Patasavong Sisouphan presented them to Wat Chom Kong, where they have been since that time. They formerly guarded the central stairway the sim. Now they flank the doorway of the nearby kuti.